Kids Math Teacher: My first publishing credit! I just found out that my blog post entry to Charity Preston's The Organized Classroom Blog got published in her August issue of The Organized Classroom Magazine. I'm on page 43 & 44! The thing I didn't really include in that post is really how much organizing involves math. Fitting items, measuring to make sure things are the right size, and the money spent all have to do with math! You can purchase this month's issue for $2.95 or get a yearly subscription with 12 issues for $24. It mainly comes in a digital format, but you can purchase a hard copy too (price varies due to shipping costs). I'm super excited! 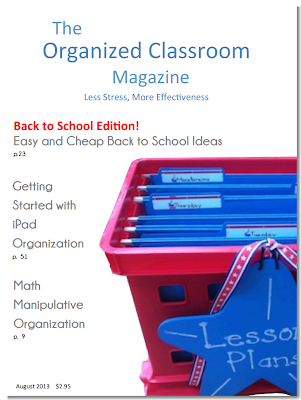 There are great back to school organizing tips! Come back and join me on Thursday for MaTh activity Thursday: Number lines! Lucy, Thanks for stopping by my blog. I am your newest follower! Congratulations Lucy! Something major to celebrate!! !